Great to see the '!' return, and it seems like a return to form. 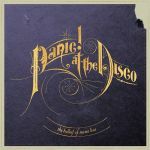 Great return for P!ATD, this sounds really good, looking forward to the album. Nice sounding track.<br><br>Edit: Up to a 5, oh so this constitutes heavy. The world makes sense now. Ze zijn terug en met een fantastische nieuwe single. Recht okay...die Melodie zündet nicht so, ansonsten fein umgesetzt. great track, hopefully this is successful in Australia. Decent. Not a massive fan of them but this is satisfying. Das Intro ist ja hammergeil! Allgemein ein toller Song, nicht ihr bester aber gut! Welcome back PATD! Nach der Single Nine In The Afternoon hätte ich sie fast schon abgeschrieben aber mit diesem neuen Song können sie mir echt gefallen. meine Entdeckung des Abends! Chipsch! Yeah, the Intro is awesome, kinda spooky, could be from a movie with weird people haha<br><br>i like the song! Thouroughly enjoyable song,<br><br>P!ATD are great as always. Toller Song! Endlich sind sie wieder zurück. gefällt mir spontan sehr gut! Not bad but the verses are boring, the only good thing is the chorus. Was very surprised this has spent over 10 weeks in my chart. 6 out of 6. And I thought "I Write Sins Not Tragedies" would be their only epic song ever. How wrong I was. A solid return to the charts for Panic! At The Disco.<br><br>Peaked at #11 on my personal chart.<br><br>Came in at #122 on my TOP 200 OF 2011. Brilliant track, but not one of their best. <br>Schöner Track, aber eine 5 ist hier zu Hoch gegriffen. Probably the most interesting rock song I've ever heard.